I have been homeschooling Cade since he started K4. He will soon be in the 4th grade and Henry will be starting K5 this year. It is a big part of our lives, so I wanted to start sharing more about it. This is not going to turn into a homeschooling blog, but I am going to do a small series, and the topic may show up from time to time. The Beginning I had no desire to homeschool my kids. I was the mom that said, "I will never homeschool my children. They will go to real school." I was homeschooled as a child for three years and hated it. Two of my closest friends started homeschooling their children, and I still said, "never". Fast forward to registration time for Kindergarten. I started the process to pre-register Cade so that he could go to the Magnet school. He was accepted, and everything was on track. Once it was time to finalize everything, it just didn't feel right. Everything about it seemed wrong. The Lord started working on my heart about homeschooling. I wasn't interested, but I knew I couldn't just ignore it. I finally had a heart change and knew that I needed to homeschool Cade for Kindergarten. I had such a peace about it. We have continued with the homeschooling thing and haven't looked back. It is a lot of work, but there are so many rewards that come with it. K4 - I did K4 with Cade at home, but didn't really plan to continue to homeschool. K - Kindergarten was fun once we made the decision to homeschool. Everything was still very new, and our days were very relaxed. 1st Grade - First grade was the year that I thought we may find our groove, but it was also the year that my mom was sick and died. It ended up being a really hard year for me, and that made it hard to really focus on school. We got through it, but I can't say that it was super fun. 2nd Grade - Second Grade was the year that we really found our groove. I figured out how I like to lesson plan, I learned a lot about the way Cade learns, and we really started to figure out a good routine that worked for us. 3rd Grade - Third Grade was a great year. The year flowed well, we continued on with a routine that seems o be working well, and we even added Henry to the mix for K4. This Year - I'm really looking forward to 4th grade with Cade and K5 with Henry. We are going to be adding a few new things that we are all really excited about. 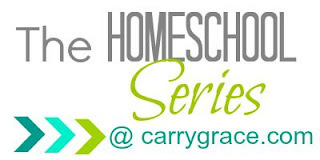 Please come back each week each Wednesday from now until the end of September for a peek into our homeschool journey. *Please Note - I am not an expert. I do not think that every mom should homeschool her children. I know that there are many schools that have wonderful teachers.I have friends and family members that are teachers and love what they do. I have a lot of respect for them. They are called to teach children. I do not think that moms that homeschool their children are better than moms that go to work or stay home and send their children to school. I am just a mom that is called to teach her children, and want to share my experiences with you in hopes that it may help someone. What works for my family may not be what works for your family, and that is okay. I have to rely on the Holy Spirit to help guide me through this each and everyday just like everything else that I do.